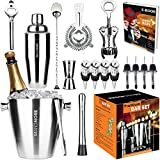  ALL IN ONE Bartender Set - Mixology set of the 17 must-have tools for professional cocktail mixing, whether you are in restaurant, bar or at home. All necessary bar supplies needed you will find in this bar tool box.  BIG ICE BUCKET - Unlike others bar sets, in our bartender tool kit we've included this big ice bucket to help you prepare more cocktails in one batch or serve a bottle of sparkling wine with style. 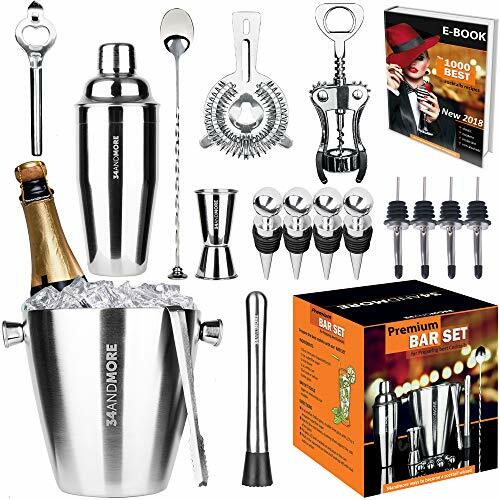  TOP QUALITY - Our cocktail bartending set contains 17 bar tools made of food grade rustproof stainless steel and perfectly polished. Buy this shaker kit with confidence in long-lasting usage - you will never need another bar tool set.  PARTY ANIMAL MUST HAVE - If you like a party for wedding, birthday, Christmas or other special occasions, you really NEED BEST BARTENDER KIT. Surprise your guests with fancy drinks by using all bartender tools from this tipsy bartender kit!